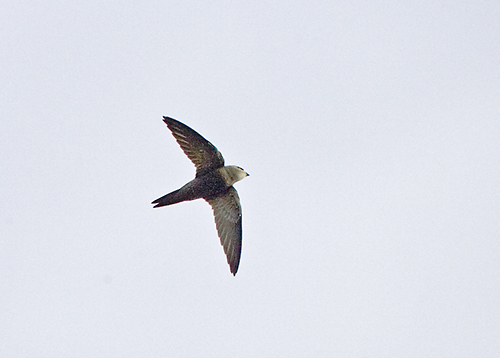 On 20-21 October 2006, a Pallid Swift Apus pallidus was present on Vlieland, Friesland, the Netherlands. It was seen by c 20 birders staying on the island on the first day and successfully twitched by c 60 birders on the second day, when it flew in large circles along the coast and over the sea. On the first day, it was often seen with one or two Common Swifts A apus, allowing direct comparison of shape, plumage and flight actions. 9 pale panel on greater and median coverts on upperwing. This is the first record for the Netherlands. Several reports in previous years were not as well photographed as this bird and, as a consequence, not accepted by the Dutch rarities committee.